خطأ لوا في وحدة:Location_map على السطر 485: Unable to find the specified location map definition: "Module:Location map/data/New York" does not exist. 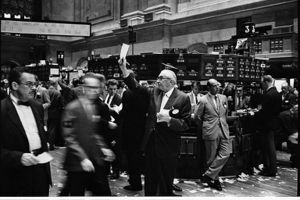 بورصة نيويورك New York Stock Exchange NYSE ، تقع في مدينة نيويورك و هي أكبر سوق لتبادل الأوراق المالية في الولايات المتحدة الأمريكية من حيث تعاملاتها (بالدولار و ثاني أكبر بورصة من حيث عدد الشركات المدرجة حيث اجتازها سوق نازداك عام 1990, و لكن القيمة السوقية للشركات المدرجة أو ما يعرف بالرسملة السوقية فهي أكبر بخمس اضعاف عن الشركات المدرجة في سوق نازداك. 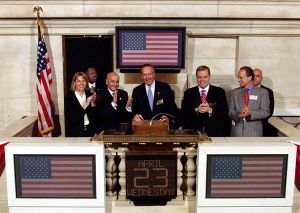 U.S. Secretary of Commerce Donald L. Evans rings the opening bell at the NYSE on April 23, 2003. Former chairman Jack Womack is also in this picture. الموقع الرسمي لمقر بورصة نيويورك لتداول الأوراق المالية هو: نيويورك, NY 10282-1101. وللبورصة مكاتب أخرى في هيوستن,واشنطن,دبي,لندن, و هونج كونج. 2007 - US President George W. Bush shows up unannounced to the Floor about an hour and a half before a Federal Open Market Committee interest-rate decision on January 31. 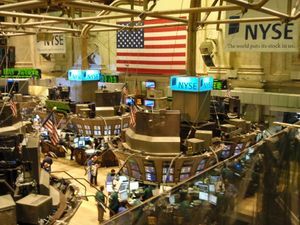 NYSE announces its merger with the American Stock Exchange; NYSE Composite closes above 10,000 on June 1; DJIA exceeds 14,000 on July 19 and closes at a peak of 14,164.53 on October 9. This was the peak or the early-mid 2000s boom before the 2008-2009 bust. 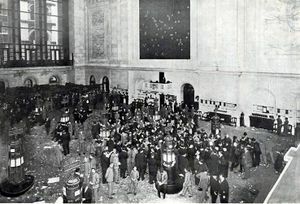 2008 - On September 15, the DJIA loses more than 500 points amid fears of bank failures, resulting in a permanent prohibition of naked short selling and a three-week temporary ban on all short selling of financial stocks; in spite of this, record volatility continues for the next two months, culminating at 5 1/2-year market lows. 2009 - Markets methodically fall to new 12-year lows in March, briefly trading below 4,200 on the NYSE Composite and 6,500 on the Dow. 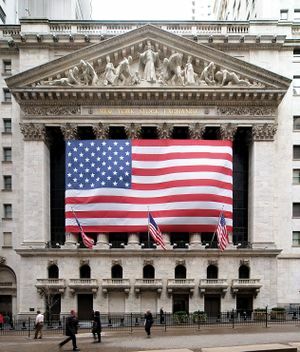 2009 - NYSE General Counsel Senior V.P. Janet K Parkhurst issues cease and desist letter to Wall Street Prison Consultants founder Larry Jay Levine stating Levine's inferences to the NYSE and crime on his website tarnishes the NYSE name and image. Geisst, Charles R. (2004). 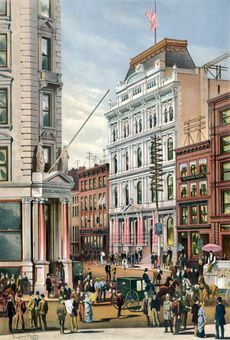 Wall Street: A History - From its Beginnings to the Fall of Enron. Oxford University Press. ISBN 0195170601. Sobel, Robert (1975). N.Y.S.E. 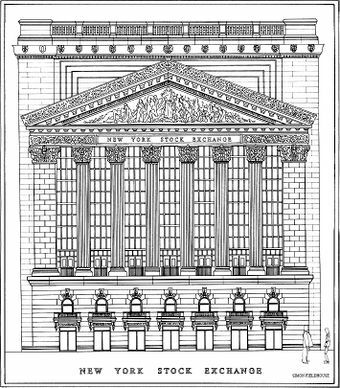 : A History of the New York Stock Exchange, 1935-1975. Weybright and Talley. ISBN 0679401245. 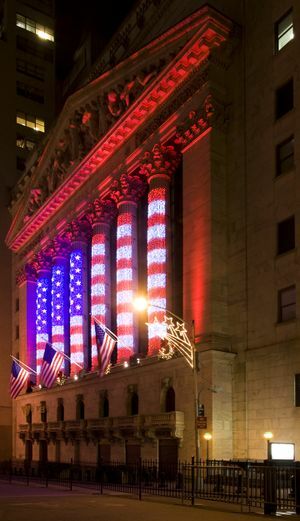 ^ "New York Stock Exchange". National Historic Landmark summary listing. National Park Service. 2007-09-17. ^ Katy Byron (2007-01-31). "President Bush makes surprise visit to NYSE". CNN Money. Cable News Network. Retrieved 2007-02-20.